Stuck for a unique present idea? Gift vouchers are always popular – would your mum love a family portrait sitting? How about a photo sitting with the family pet? A boudoir session for the very special woman in your life (choose option 5 from the drop down box below)? A birthday makeover photoshoot for your wife or daughter? Or have you booked Symply to be your wedding photographer – and would love an upgraded album or a beautiful framed picture of your wedding – but don’t know how you can afford it on top of everything else? 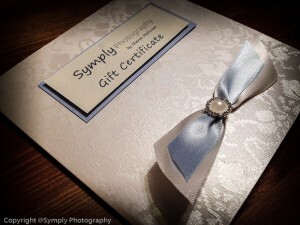 Why not put Symply Photography Gift Voucher’s on your wedding present gift list? The photography gift vouchers can be purchased from just £25 making it easy to give anyone the gift and experience of photography. Click the Buy Now button and then simply select the amount you would like. The voucher will then be mailed direct to you in a beautiful presentation folder, and the recipient can then book a sitting at a time to suit them at the studio in Billingborough near Sleaford. Vouchers valid for 6 months.